Home » » Anambra State Police Command nabs armed robbery suspects in their hideout, recover arms, car. Anambra State Police Command nabs armed robbery suspects in their hideout, recover arms, car. 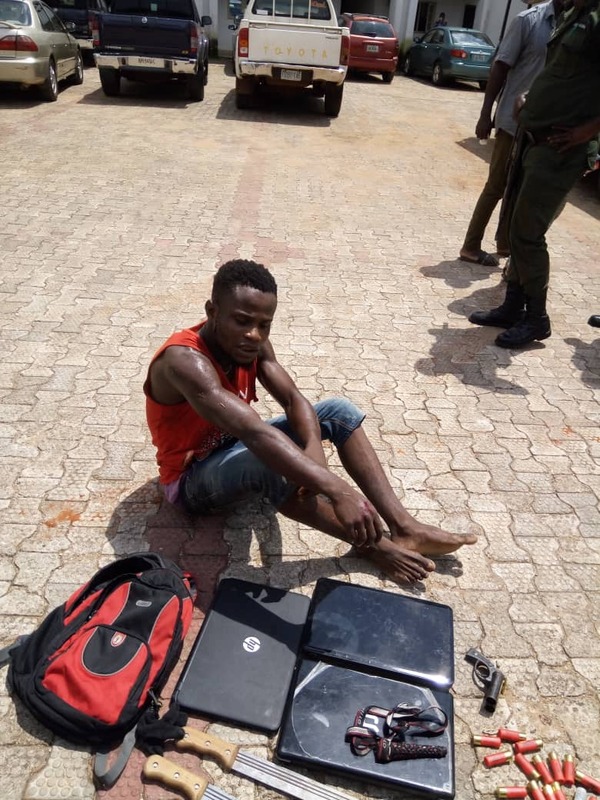 The Anambra State Police Command has arrested an armed robbery suspect, Atakpa Ikechukwu, in his hideout in Amansea, Awka North Local Government Area of the state. Atakpa, an indigene of Aguleri, Anambra East LGA of the state, was arrested following intelligence report gathered by the Police patrol team attached to the Department of Operations, Awka. The 22-year-old, whose accomplice, John Osita, 21, has also been arrested at his hideout in Amansea, has been handed over to FSARS. The state Police Public Relations Officer (PPRO), SP Haruna Mohammed, who confirmed the incident, said: “On 1/11/2018, at about 4PM, Following intelligence report, Police Patrol team attached to Department of Operations Awka arrested and handed over to FSARS One Atakpa Ikechuckwu ‘m’ aged 22 of Aguleri, Anambra East Local Government Area. “Further investigation led to the arrest of his accomplice one John Osita ‘m’ aged 21 years in his hideout at Amansi in Awka North LGA of Anambra State. Items recovered from the suspects include, one Toyota Camry, Model 2001 stolen from the first victim, 1 fabricated Pistol, 25 Cartridges, 5 laptops, 2 machetes, International passport belonging to the Prof. Hacksaw, handsets and other accessories. According to the PPRO, the suspects who have confessed to the crime are assisting the Police with useful information that could aid investigation after which they would be charged to Court for prosecution.